Description: Stem: branches 0–many, Flower: sepals 3–10 mm, greenish to purple, darker in bud or not; petals 5–13 mm, whitish or purplish, generally wavy margins are thin, dry, pliable translucent or variously colored, but not green. Leaf: Lower blades 1–25 cm, oblanceolate (lance-shaped, with the broad end at the top) to oblong, upper blades linear to oblanceolate. Notes: Photographed May 8, 2004 on Whitney Portal Road, Kern County, Calif. A dicot, is an uncommon annual or perennial herb that is native to California and is also found outside of California, but is confined to western North America. 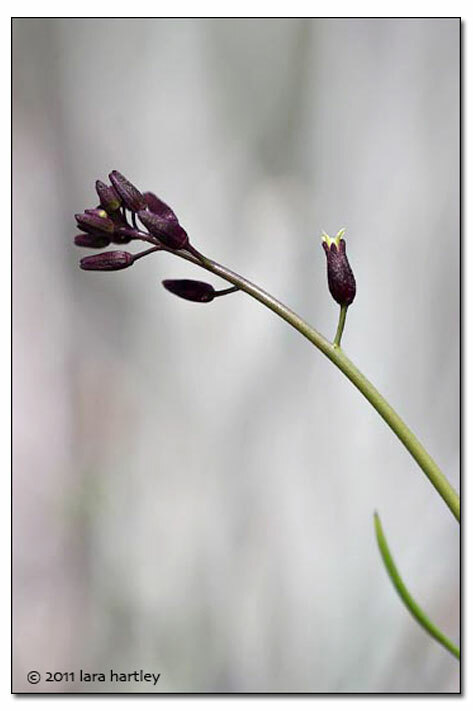 Distribution outside California: to se Oregon, s Idaho, w Utah The common name "chocolate drops" refers to the dark-colored sepals which are more obvious than the actual whitish flowers.